Living up to its billing as one of the well-loved shoes among the Air Jordan numbered series, another Air Jordan 3 surfaced and is said to be lined-up for this month! 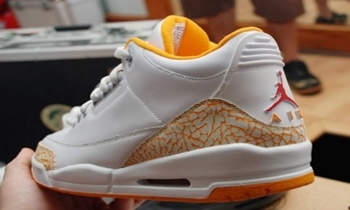 The white/orange colourway of the Air Jordan 3 is generating buzz despite its simplicity. The silhouette features an all-white upper paired with orange accents on the lining and the famous elephant print plus varsity red Jumpman Logo on the back that also sits on an orange outsole. This one looks attractive so you must watch out for this one!